Sam Mayer at Salem Speedway via GMS Racing on Twitter. 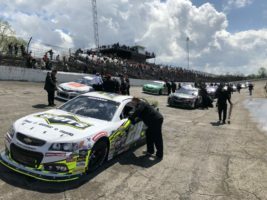 Sam Mayer and the GMS Racing team was racing with heavy hearts at Salem Speedway this weekend, as a co-worker, Jonathan Morrison, known as “Outlaw,” passed away this weekend. They were hoping to put the No. 21 machine in victory lane so they could dedicate the win to him. However, Mayer and the team fell one spot short as he finished second to race winner Michael Self. “It was pretty crazy starting in the back like that about mid pack,” Mayer told MAVTV post race. “I felt like we had a good car overall, I wish we would have been able to put four tires on it after that restart and go see what she had, but it got rain delayed and eventually canceled. For Mayer, it was his best ARCA Menards Series finish and his best finish since IRP last summer where he finished seventh. Carson Hocevar, backed by the No. 28 team, collected his first ever ARCA Menards Series pole of his young career. 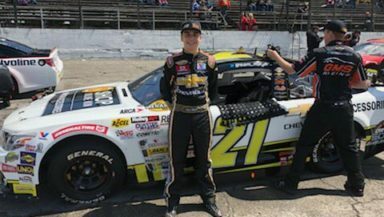 It was the 16-year old’s first ARCA race back since IRP of last year, where he finished fifth after starting second that day. However, that was the past and this is the present. Hocevar was hoping to put the No. 28 machine in victory lane today, but fell three positions short. He got passed by eventual race winner Self for the lead on Lap 18. After that, Hocevar could never really catch the leader again. He quietly ran in the top five for the rest of the race. Hocevar ran his race, but the rain came and he wound up third. But he wanted to go back racing and was a little unsatisfied with a third place finish. It was Hocevar’s third top five of his career and first of the season.